Wigan Athletic slumped to another disappointing home defeat when they lost 1-0 to Cardiff City and moved closer to the trap door to League One. Aron Gunnarsson slotted home the game’s only goal after 20 minutes, although Latics had two goals disallowed for offside which on another day might have stood. For a team supposedly fighting for survival Latics were toothless in attack and had fewer efforts on goal than the visitors. Mackay made three changes to the side which was beaten by Charlton Athletic, with both Jermaine Pennant and Gaetan Bong making their first team debuts in place of the injured duo of Leon Clarke and William Kvist. Club captain Emmerson Boyce was recalled in place of Andrew Taylor. Latics created an early opportunity on 14 minutes when Pennant headed Bong’s cross from the left wide of the far post. But despite enjoying plenty of possession Latics went behind on 20 minutes. Kenwyne Jones headed the ball into the path of Aron Gunnarsson who easily avoided some half-hearted challenges by Wigan defenders before calmly slotting the ball past Ali Al-Habsi. Wigan continued to enjoy plenty of possession but rarely threatened the Cardiff goal. It was not until defender Emmerson Boyce broke forward, making his 250th appearance for the club, that Latics created an opportunity, but Marc-Antoine Fortune was unable to get onto Boyce’s through ball. Latics should have been level seven minutes from half time when Bong flicked on Fortune’s cross in the direction of James McClean, who finished comfortably into the bottom corner. The linesman ruled that McClean was offside, but subsequent replays indicated otherwise. Wigan continued their dominance of possession after half time but struggled to create clear chances. Marc-Antoine Fortune did have an opportunity in the 54th minute but he fired over the crossbar from a tight angle. With fifteen minutes remaining on loan defender Harry Maguire almost got onto the score sheet when his low drive from the edge of the area was tipped around the post by Cardiff keeper Marshall. Soon afterwards Latics looked to have got the vital equaliser when Boyce crossed for substitute Martyn Waghorn to finish with aplomb, but the linesman once again controversially flagged for offside. Cardiff might have doubled their lead with two minutes of normal time remaining when Sean Morrison headed narrowly over the crossbar from a Peter Whittingham cross. Latics were unable to muster a grandstand finish and the three points went relatively tamely to Cardiff. Wigan had been unlucky with the two offside decisions but overall they lacked any great conviction and had fewer shots than the visitors. 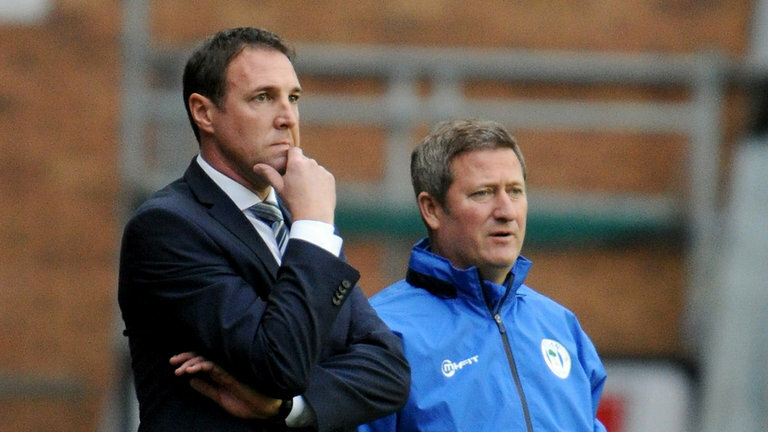 The desperately poor run of form continues and manager Mackay and his assistant David Kerslake look lost for ideas and unable to have any positive impact on results. Despite overseeing a massive turnover in playing staff results have not improved under Mackay. Wigan have only won 2 of his 16 League games in charge and they are now 9 points from safety with 13 games remaining. This entry was posted in Aron Gunnarsson, Cardiff City, Championship, David Kerslake, Malky Mackay, Wigan Athletic and tagged Aron Gunnarsson, Cardiff City, Championship, David Kerslake, Malky Mackay, Wigan Athletic. Bookmark the permalink.